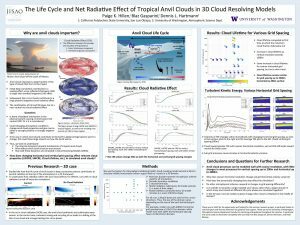 This summer I worked for the Atmospheric Sciences department at the University of Washington. 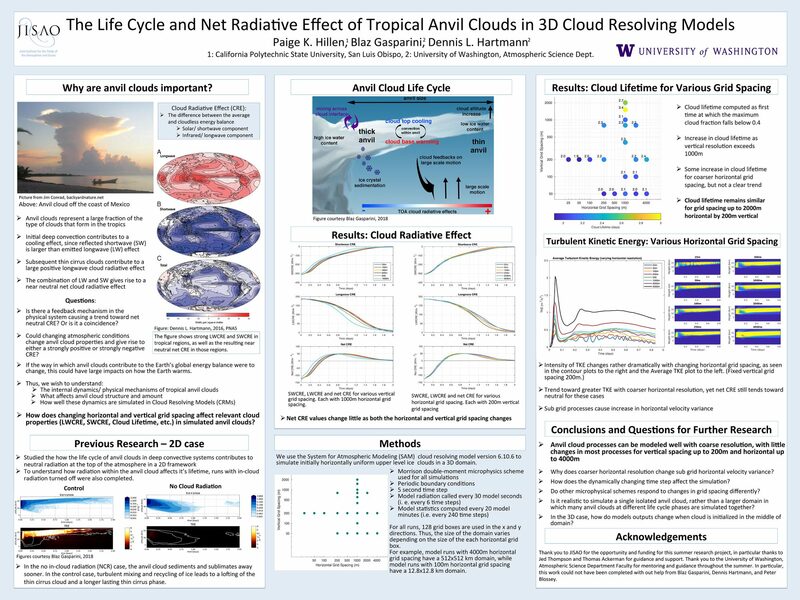 We used the System for Atmospheric Modeling, configured as a 3D cloud resolving models to study the lifetime and net radiative effect of tropical anvil clouds. I spent the first few weeks learning the basics of atmospheric dynamics, cloud physics, and climate models. Then, I learned how to set the parameters and initialize the cloud model. Finally, I ran several models, analyzed outputs, and tried to make conclusions about how well anvil clouds are simulated. Anvil clouds consist of an initial deep convective core and a subsequent thin cirrus cloud. These clouds are interesting and potentially important to the global climate, because despite having a net neutral cloud radiative effect (CRE) , they have large positive longwave CRE and a large negative shortwave CRE, which cancel each other out nearly perfectly. 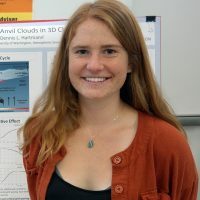 In order to better understand what effect tropical anvil clouds have on climate and how well they are simulated in cloud resolving models and global climate models, we ran several simulations of upper level ice clouds with varying horizontal and vertical grid spacings. I analyzed the output data from these simulations using MatLab. Overall, we found that we could use a surprisingly coarse grid spacing for both horizontal and vertical grid spacing and still have a near neutral net CRE in the model output. Overall, I learned a lot about how research is conducted in the field of atmospheric science and how climate models are verified and improved. I really enjoyed my summer in Seattle, and am grateful to have had the opportunity to participate in this JISAO internship! 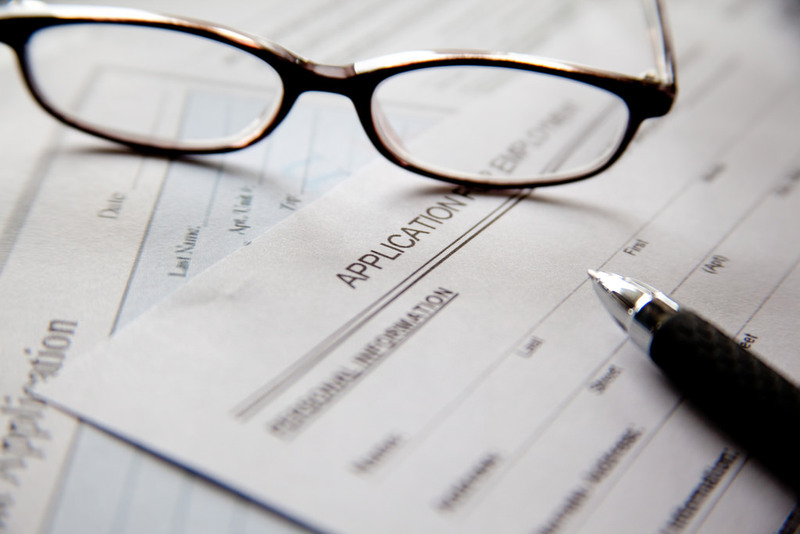 2019 applications are now available. To apply please send the application form, resume, transcripts, two letters of recommendation, and a cover letter (1-2 pages telling us about yourself, why you are interested in this internship, and what makes you unique) to jisao@uw.edu. Items may be sent together or individually.